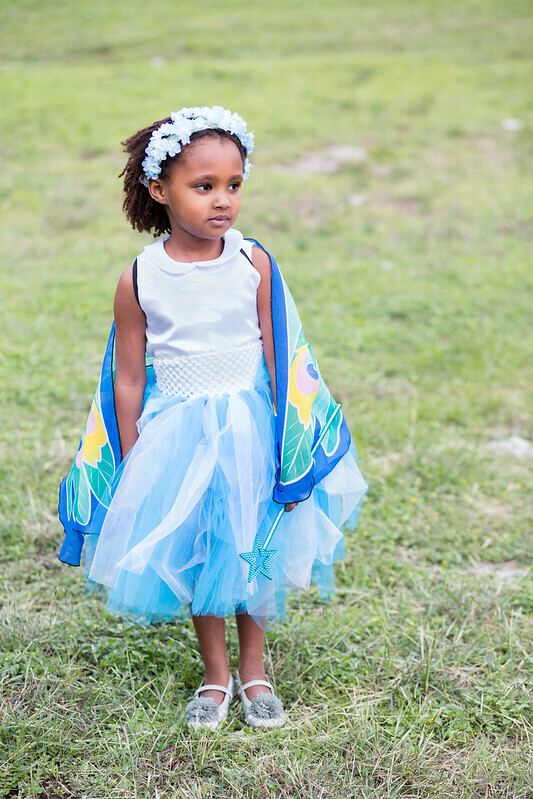 When I discovered I could make Indigo's Little Red Riding Hood dress/tutu by simply tying strips of tulle to a crocheted headband, I was pretty ecstatic. Prior to that revelation, I had imagined the drudgery of gathering yard after yard of tulle. (Gathering is among my least favorite parts of sewing.) 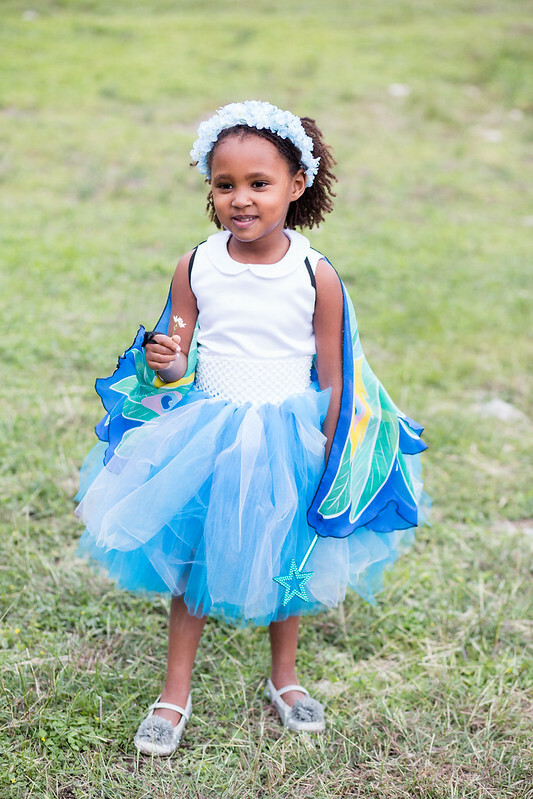 So when Tarikua said she wanted to be a fairy for Halloween, I was happy to make her a poofy tutu of her very own. I used two strips of tulle per crocheted hole, starting on the second row from the bottom. Making three tulle skirts turned me into a bit of a tulle connoisseur. 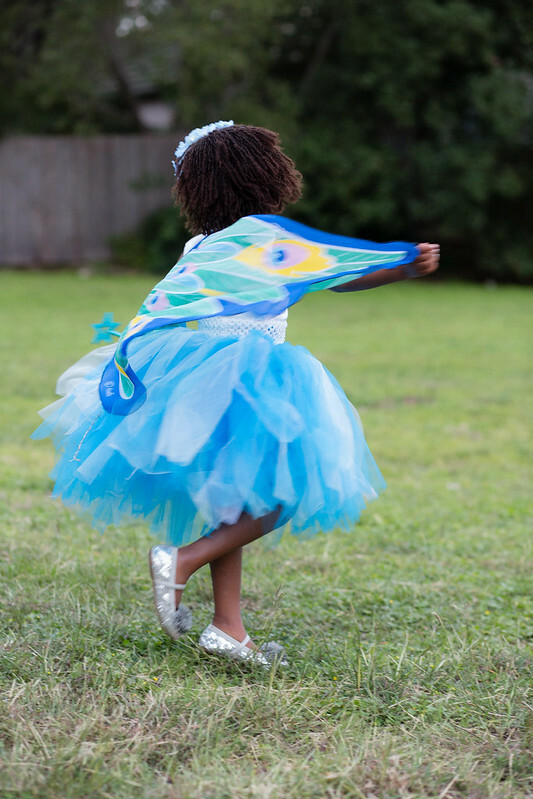 I found I much preferred using tulle by the yard than tulle-on-a-spool. Even though tulle on a spool comes packaged in a 6 inch width, I found it more tedious to cut in bulk. It was also more expensive, scratchier and more transparent. Tulle by the yard was softer yet more substantial. Using a cutting mat and a rotary cutter, I was able to cut piles of 6" x 20" strips for this costume in a matter of minutes. 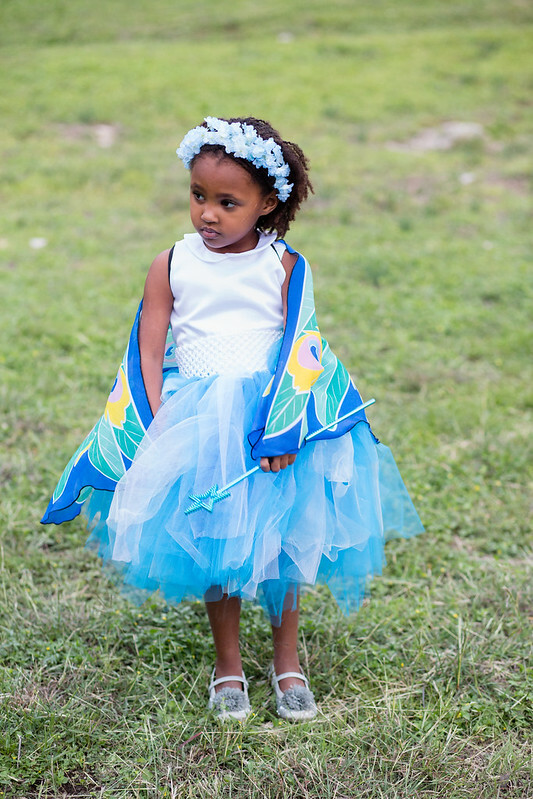 For Tarikua's tutu, I used 13 yards of tulle: 7 in blue, 3 in light blue, and 3 in white. I made Tarikua's top using the hanami bodice pattern sewn in a glittery satin from Joanns. I initially planned to use this oversized flower crown for the costume. But it ended up being a pretty big pinterest fail. The flowers were too heavy to stick to the ribbon for long, despite my dear husband trying various ways to adhere them. Those big, beautiful flowers aren't cheap, either, even at 50% off, so I was disappointed it didn't work out. But we found some small blue fake flowers, which Dan hot glued to the headband. I think he did a fantastic job with it. I love it. 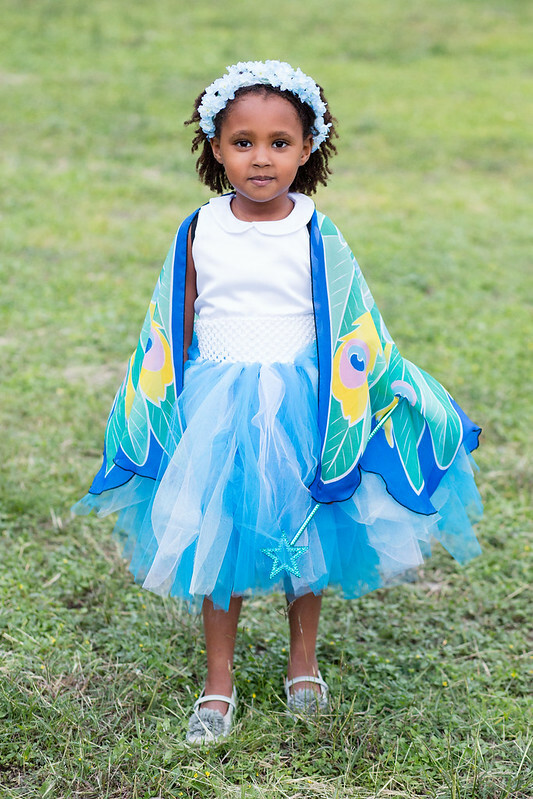 The wings are from our costume stash, a birthday gift (bought here) for Indigo last April. She is just so darling! What an amazing costume. 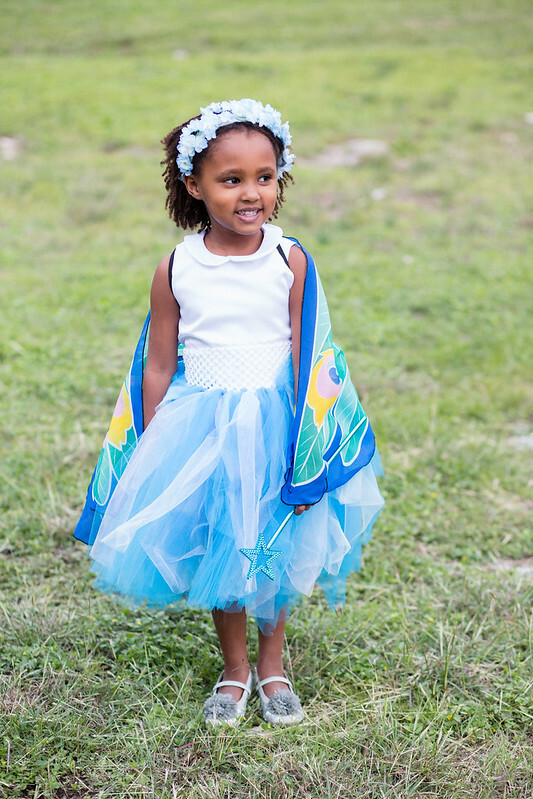 I love the tutu, and all that blue. Tarikua is such a sweet fairy! A true fairy, that's what she is! Gorgeous. Both costumes are so fantastic! I'm giggling a bit inside because I had such a struggle with the tulle on my daughter's skirt for her costume. I looked around on the internet a bit and saw a bunch of tied versions, but I convinced myself they'd be harder than sewing a skirt. I think next time I'll definitely try it this way. I have so little patience for costume sewing, but have found that they are the things my kiddos love the most. Can tell both of your girls are thrilled as well! Fantastic costume and bonus points for having a husband who can hot glue a headband! Hubby saves the day! I am SO with you on the gathering struggle . . . even now, after doing it countless times, it's still my least sewing ask by far. 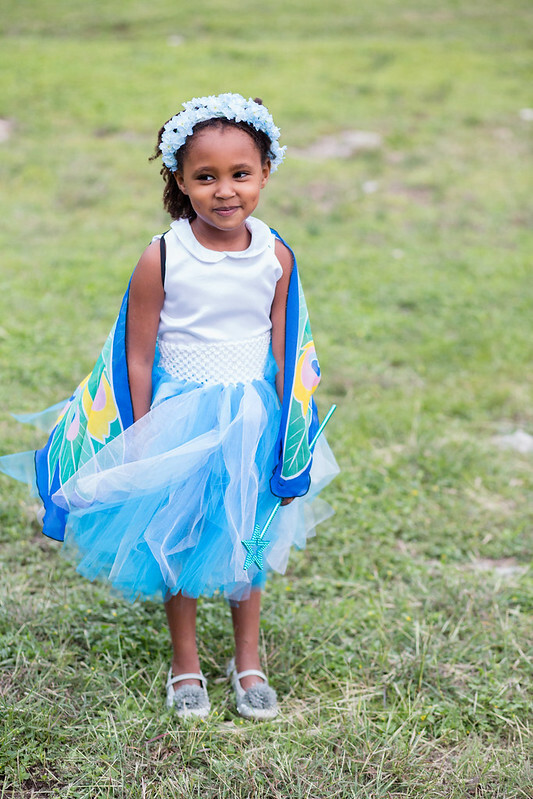 So yay for a gather-less tutu! 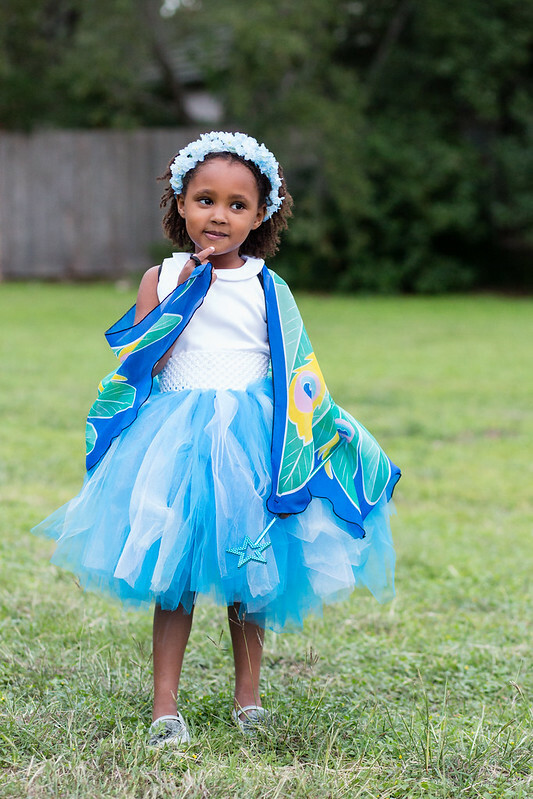 It's such a beautiful tutu - love the layered colors. I'm sure it will be worn long after Halloween! it's good to know we're not alone! ;) thanks, lucinda!